Ultrasound is a widely used, safe and accurate diagnostic imaging procedure to assess internal organs using sound waves beyond audible range. The handheld device called, transducer, sends out high frequency sound wave into the body and receives the echoes back after interaction with internal tissues. Varying amount of echo return depends on the type of tissues and depth and this creates the ultrasound image in different greyscale. 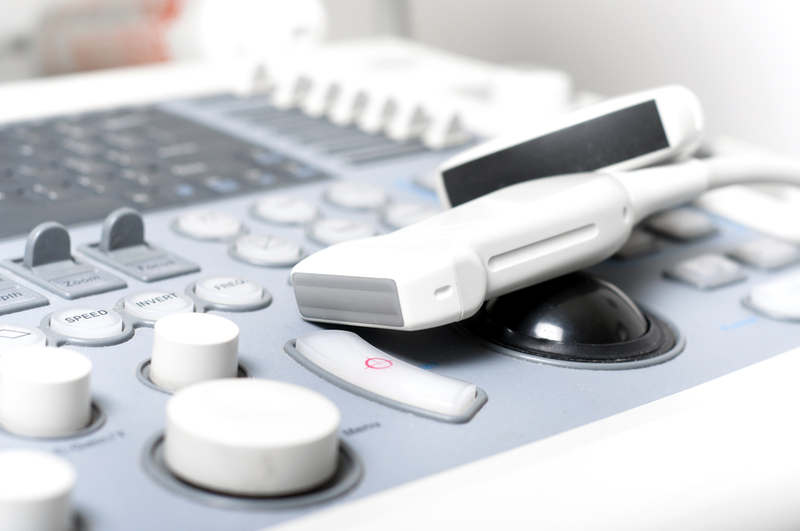 Ultrasound images are captured in real-time. They can visualise the internal structures and the functions of moving structures such as foetal heart or blood flow. Except in guided biopsy, ultrasound exams are non-invasive and very safe examination because no radiation and no oral or intravenous contrast are used. Preparation may differ depending on the type of exam being scanned. Specific preparation requirement will be informed at the time of booking. Wear comfortable and loose fit clothing to your appointment. You will be covered during the procedure but may be asked to wear a gown and only the area for scanning access will be uncovered. Fast for 6-8 hrs prior to exam so the scan preferably booked in the morning. No food, no drink, no smoking, no chewing gum (1-2 sips of water for regular medicine intake is ok). Fasting is essential because the abdominal organs are difficult to scan with intestines filled with air and ingested food. Ultrasound cannot penetrate through air to create an image. By fasting the intestines become relatively empty with minimal air obstruction. Also through fasting, the gall bladder preserves its shape for accurate assessment because without food to digest it does not shrink for bile secretion. For children under 6 years old, no preparation is required but preferred to fast for 4 hrs. Drink about 1L of water one hour before the Ultrasound exam. Need to have a full bladder and hold until the exam. Do not need to fast. The bladder works as an “acoustic window”, which helps the sound waves get through for imaging. Also by filling the bladder, the intestines that usually lie between the pelvic organs and the bladder are moved out of the way to have clearer view of underlying organs. For most biopsy procedures, no preparation is required. However, if the biopsy involves an area such as the liver, we may request for you to cease blood thinning medication prior to the biopsy.